Industrial businesses are some of the first ones people may think of when they consider concrete and epoxy floors. These businesses often put their floors to the test with all of the high foot traffic and heavy machinery that rolls across them. Warehouses and industrial buildings also often store heavy equipment and items that can put pressure on flooring. Concrete flooring and epoxy flooring are both high duty floors. These are smart choices for high traffic flooring. These floors can also often be found in car and motorcycle dealerships, trendy warehouse style stores in city centers and basements and garages in residential areas. Many home owners are taking advantage of the longevity of these floors. Epoxy design has come a long way in the last few decades. Epoxy flooring can be designed to look trendy and functional. Homeowners have been using epoxy in their basements if they often experience seepage or live in areas prone to flooding. Epoxy is very durable and can withstand water and other elements. Epoxy flooring in garages gives the garage a more modern look. 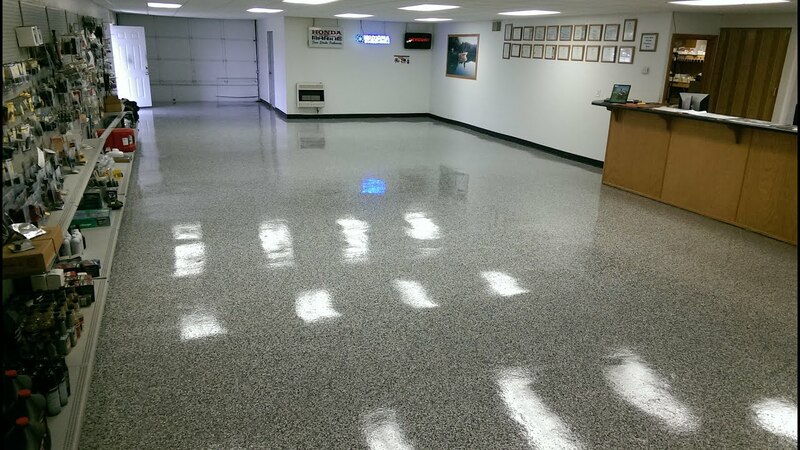 Another benefit to epoxy flooring is the high shine finish that allows for easy cleaning. Cars bring the elements indoors when they are parked inside garages. The snow, rain and mud that are caked to the under carriage of cars often falls off and slowly damages concrete garage floors. Epoxy floors hose clean easily and do not show stains and wear as easily as concrete floors. Industrial kitchens are also utilizing epoxy flooring for its easy to clean and maintain properties. These floors can also be designed with anti-slip properties which make kitchens safer places to work. Recently designers have even started utilizing epoxy in counter top design because of its style and durability. What happens over time when the epoxy or the concrete starts to wear down and show signs of age? Some businesses that provide installation also provide warranties. The warranty for the floor depends on the type of materials used and the installation company. Some floors come with a short-term warranty that only covers mistakes that may occur from installation while others may cover damage that can occur over the course of several years. It is important to make yourself familiar with the warranty of the product prior to installation. If you find damage on your floor and discover that you are not eligible for warranty coverage there are companies that specialize in floor repair. If you are seeking floor surfacing Kansas City MO has specialists that are equipped to resurface and rejuvenate floors that are showing signs of stress. Kansas City Missouri is home to many elements that can cause damage to concrete and epoxy floors. This region experiences a true four seasons a year which includes the cold and rainy fall months, freezing and snowy winter months, rainy spring months and the hot summers. The constant change in temperatures in combination with the ever-changing temperatures can cause the ground to settle which may result in cracks or disturbances in the concrete or epoxy. When you seek out a floor surfacing company be sure to read reviews and fully understand the repair and refinishing process.